In Wednesday’s action, Thomas Rosell correctly identified the day’s first post the long lost Meridian City Hall and Market, with ed polk douglas and donnaballard able to provide more information for a single point each. 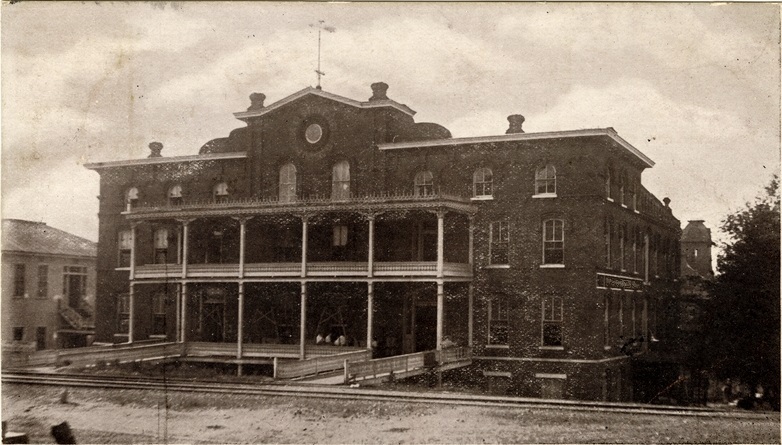 The second building was Capitol Street Methodist Church in Jackson, identified by Belinda2015 for two points with Thomas Rosell, ed polk douglas, Photograham, sec040121, and Mississippian in Exile getting one point each. Victoria M Conway got the third post, (old) First Baptist Church in Columbus; C, Thomas Rosell, and ed polk douglas received single points for their contributions, which included a back-and-forth between the latter two about which London church inspired First Baptist’s exquisite spire. The fourth and final building was the Mid-Century Modern Vandiver Student Union at Mississippi Delta Community College in Moorhead identified by Thomas Rosell; he added much information about it, leaving little else for anyone to add. Although it is Thursday, even if you have not participated yet, there is still time to participate in the contest. It may look like a three horse race, but Thomas Rosell went from 1 point after Tuesday to 7 after yesterday’s action; so, even now, you just maybe could catch the leaders and certainly could play spoiler. Read The Rules (such as identifying the city the building was located in and entering your answer in the comment section, not on Facebook), and be the first to Name This Place. this is a stumper, as your promised. never seen image before –image looks 1870s.quirky italianate. style structure, with simple greek revival doorways. maybe a hotel(is there a sign on the right side?) or institution. ‘hilly’ location, perhaps vicksburg? can’t make out much of the church steeple in the distance, on the right.yes, know i am giving hints to others,but maybe i can get a point inspiteof the fact that i don’t know the building. and, one of those days that i must do other things than this, even though it’s cold and damp, with snow flurries now. I removed the lettering from the painted sign on the side facade. It was barely legible, but I did not want someone to simply Google the name of the building and get the answer. I have actually done that during this competition to every photograph that has a potentially identifying label. i take back one previous comment–doorways are italianate, with arched tops–so hard to see clearly on my laptop. and, note the different spacing of the third floor windows from those below– i am guessing that there is no hallway on the third floor above the hall on the floors below, so the space from the outer wall was divided equally between three rooms. strange things that look like wooden exes on the first floor porch between the doorways—if those are seated people on the porch, the scale of the building is quite large…. One hour in, no correct answers. I may be on my way to my first four points. I actually looked in a book (gasp!) for what happened to the building, but I think there are some things posted online about the hotel; so, the date is out there. After 74 years since it burned, it has turned into one of those lost buildings that no Mississippian (or nearly no Mississippian) has seen in person. Iuka certainly lost its great landmark and has never been able to replace it with anything of equivalent size and quality. Dang–I hate this lag time. None of these were showing when I posted! There is plenty more information around for you to still get a point, slow internet or not. Also known as Mineral Springs Hotel. The town was never known as Iuka Springs. What you read simply referred to the springs in Iuka. Built in 1872 for those taking the mineral springs baths. Looking at this comment, you get a point for telling us why the building was constructed. Oh, wait! I did know the city hall in Meridian but I didn’t see the post until today! There will be more posts today and tomorrow for you to get that point total above zero. Posts are scheduled on the hour scattered from 7:00 a.m. to 7:00 p.m.
could this be a martin siegrist commission? This is not Jeopardy!, Ed. Answers in the form of a question are just questions. and, yes, that was a question, since i had nothing but ‘aesthetic reasons’ for pushing the siegrist name out there…. wasn’t able to get back to that mdah site that listed siegrist’s buildings to check. i am using the quiz for brain exercise and to challege other participants to do the same thing…. I am not going to give any of my speculations or theories until other people have a chance to answer and possibly get a point. The Mineral Springs Hotel was purchased by the adjacent Iuka Normal Institute in the early 1890’s following a depression. The school closed in 1901 and the Mineral Springs Hotel reopened for business in 1902. But I think that it had been known as the Iuka Hotel before it closed and became the school, as Suzasippi called it. If I am not mistaken at four stories this is the tallest building, as far as habitable floors, that we’ve had in this Name This Place contest. It is interesting that this structure addresses the railroad with its front facade. It sat between the Fulton and Aberdeen Streets. Here is the same view today.